HHS Says Supplements Send 23,000 People to the Hospital ER! Each Year! Balderdash. The agency’s own CDC data shows that supplements are overwhelmingly safe. Action Alert! The mainstream media is using a new study funded by the US Department of Health and Human Services (HHS), released last week, to renew the false charges that supplements are unregulated, unsafe, and require more federal oversight. Even a cursory examination of the data provided in the study, however, demonstrates once again that the alarmist headlines and the calls for tighter regulations are completely unsupported by the evidence. First, over 20% of the cases analyzed were the result of unsupervised children swallowing pills. 40% of cases among those 65 and older were caused by choking. Many other cases were heart palpitations from ingesting too many diet pills, sexual enhancement pills, and energy drinks. Undoubtedly some percentage of these so-called dietary supplements were simply illegal substances, but we aren’t told what the percentage is. One of HHS’s agencies, the Centers for Disease Control and Prevention (CDC), reports that there were actually only 3,249 supplement-related adverse event reports submitted, either from doctors or hospitals, to the FDA in 2012—a far cry from the 23,000 being claimed in the study. Part of the gross discrepancy in the numbers is likely due to the fact that eye drops, ear drops, and other over-the-counter products that are not dietary supplements were apparently included by the researchers. Why they chose to do this, they will have to explain. The study also omits important details on the adverse events counted. For instance, it does not report which products caused the adverse events. This is important because many adverse reactions could be the result of a handful of “adulterated” (illegal) products. The FDA already has the authority to remove adulterated products from the market. Supplements are further regulated by the FTC and must also follow stringent good manufacturing practices to ensure that products are safe. In fact, the study actually demonstrates something we have been saying for a long time: supplements have an exemplary track record of safety. Considering that about half of all Americans—about 150 million people—use dietary supplements, even the inflated 23,000 number represents only about 0.015% of dietary supplement users. Pharmaceutical drugs, on the other hand, even when properly prescribed, cause an estimated 1.9 million hospitalizations and 128,000 hospital deaths each year. Deaths outside of hospitals would add considerably to this total if recorded. If public health were truly HHS’s concern, shouldn’t they be focusing on prescription drugs? What explains the misleading focus on supplements? Not surprisingly, some of the authors of the study are FDA officials. For years the agency has been trying to increase its authority over supplements, attempting to institute a drug-like approval system for them. Because Big Pharma pays the FDA’s bills and provides cushy post-government jobs, we suspect that a lot of this is attempting to curry favor with drug companies. 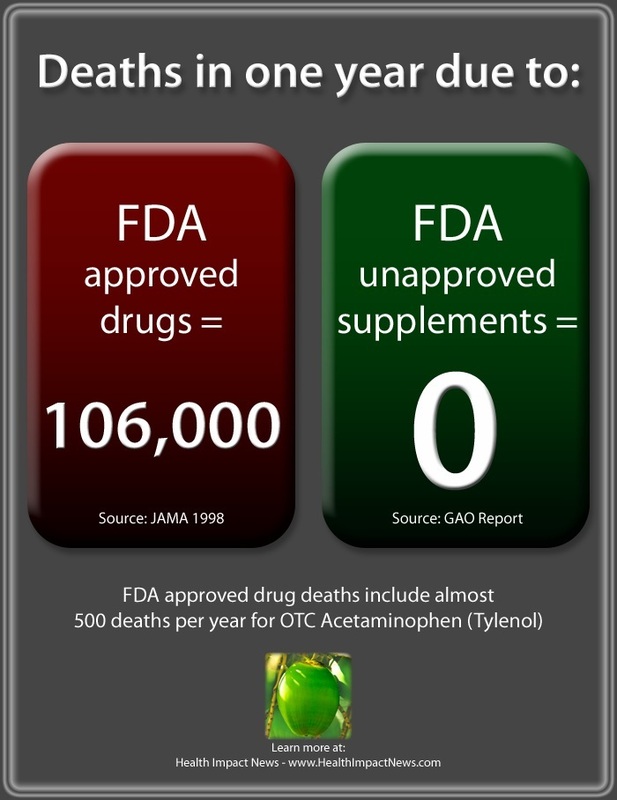 A drug approval system for supplements, remember, would lead to the destruction of the industry. Unable to pay the exorbitant cost of the FDA approval process (because they sell unpatentable natural substances and could never charge enough to recoup their investment for even one of their products, never mind their entire product line), supplement producers would have to shutter their doors, eliminating thousands of products from the market. This removes competition for Big Pharma and allows them either to monopolize the supplement market or more often try to turn supplements into hugely expensive prescription drugs. Don’t be fooled by the headlines. The overall strategy at play here has little to do with consumer safety and much, much more to do with bolstering the bottom line of the world’s major pharmaceutical companies. For more information on supplement safety, visit our SupplementFactCheck.org. Action Alert! Send a message to HHS, urging them to stop their smear campaign against supplements and to fairly represent the facts. Please send your message immediately.